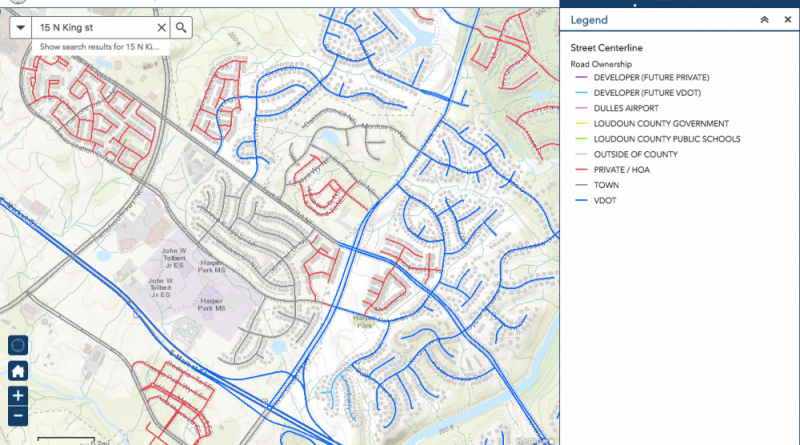 Loudoun County has launched a website to help residents figure out who’s responsible for their road, such as for repairs or snow removal. Users may search by a street address, view responsibility by color-coded system or click on a specific road and a pop-up box will appear indicating road maintenance responsibility. The responsibility for road maintenance in Loudoun County varies by road. Most roads are maintained by the Virginia Department of Transportation, one of the county’s incorporated towns, and private entities, such as homeowners associations. As new roads are constructed, maintenance responsibility may change from one entity to another, such as from a developer to a HOA. The Loudoun County map will be updated monthly. For a link to the map and contact information for the various entities involved in road maintenance go to loudoun.gov/roads.